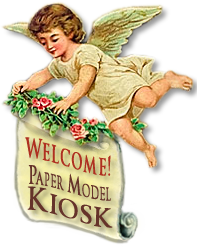 This Egyptian Crèche Collection offers a 13 x 19 quality ink-jet print on professional media, semigloss, paper to create a 9-inch nativity, anda Premium Download of a 7-inch version that prints on letter-sized paper. The Egyptian Nativity Sheet — You'll have to see the large 13 x 19 inches Egyptian Nativity Sheet to really appreciate its bright colors and fine quality. The Premium Download — All the images and assembly instructions you need to print and create 7-inch-wide Egyptian Crèche. Why a Premium Download and a Nativity Sheet, you might ask? Because you're telling us you often take your download to be printed commercially, to the tune of twenty or more dollars. So we are offering youa 13 x 19 sheet — too large for most printers — a professional 8-ink print with ektachrome inks resistant to fading. And our professional-media paper produces an astonishing quality. 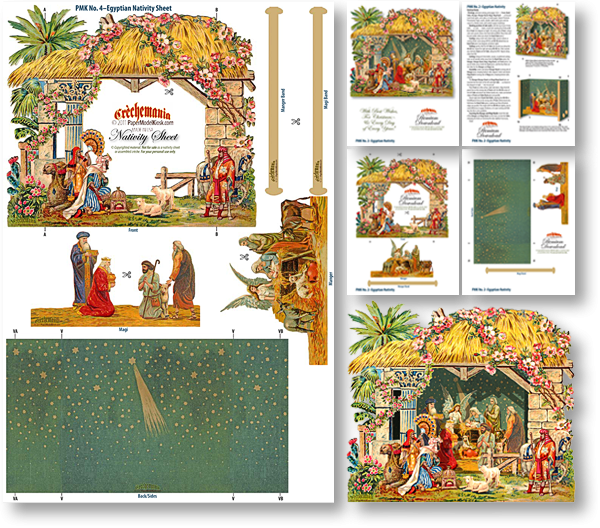 Realizing that, once you've created your large Egyptian Crèche you might wish to print moreto your heart's content, of a smaller size that fits on standard 8.5 x 11 inch paper, we've bundled the Egyptian Crèche Nativity Sheet with the Egyptian Crèche Premium Download. Egyptian Nativity Sheet is simply one of the most beautiful in the whole prodigious Crèchemania Collection — with pride and the knowledge that you'll appreciate it just about as much as we do. A PDF of the assembly instructions will be sent to you with this order. How much do I enthusiasts love this nativity?Let me put it this way: when my friend Celso Rosa flew to the U.S. from Brazil, then drove 9 hours Crèchemania, a Egyptian Nativity Sheet was tucked into his suitcase. With this Premium Download, you can print and create a beautiful Egyptian Crèche any time. Your printer's not up to snuff? Then this glorious 13 x 19 sheet — a quality ink-jet print on professional media semigloss paper that creates a glorious 9-inch wide nativity — is for you. Size: 7 x 6.5 x 1.25 inches.